Another terrific and one of the oldest postcards of San Francisco I’ve seen; the Embarcadero from the Ferry Building tower when it was still called East Street. That’s Telegraph Hill on the left, and Alcatraz out in the Bay. This 1942 photo was taken on the last day of the foot bridge before it was dismantled for salvageable war material. The doughboy soldier was there to symbolize 1918 when the bridge first opened. 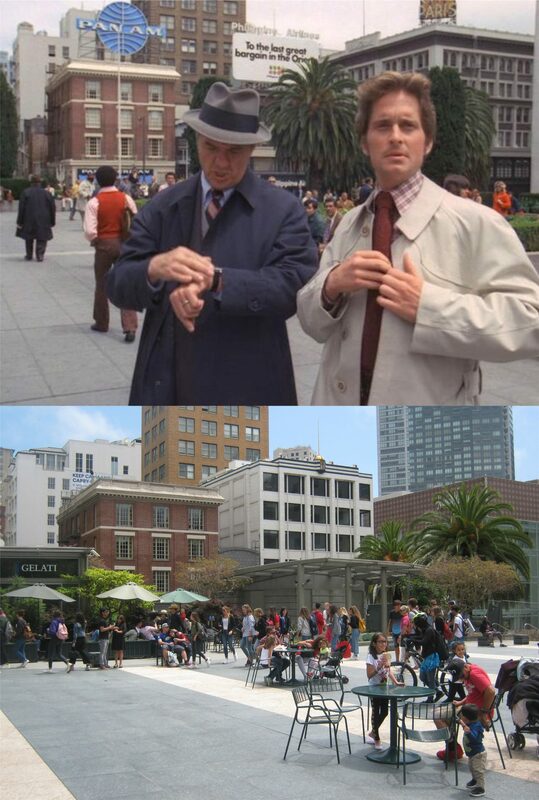 The Falcon (Tom Conway) being “kidnapped” by a little girl in front of the Ferry Building: It was, probably a backdrop, but that was the location in the film. ← “Oot ‘n’ aboot” in the City.